Mona Ottum, MS, RDN, IFMCP, CLT, CD Essential Balance Nutrition L.L.C. I’m a dietitian and I’m a food snob. I want things to taste really good. But I also want them to be really nutritious and health supporting. Let’s face it. Muffins at the local warehouse store are small sugary cakes. The only difference between them and a giant decadent dessert cupcake is the absence of frosting. In fact, as a Functional Medicine trained dietitian, one of the most frustrating things to me is how poorly Americans eat at breakfast. When you have just gone 11 or 12 hours without any food, the first thing we typically put in our bodies is a big load of refined grains and sugar with absolutely no protein to kick start your brain (make neurotransmitters) or fat to flush your gallbladder and smooth out your blood sugar so you can make it through the morning. This stable blood sugar enhances longevity and prevents diabetes and heart disease. Breakfast cereal, toast, bagels, coffee cake and those store bought muffins I mentioned will not get you through a busy morning or keep you well long-term. But these muffins will. And they are as delicious as they look! Let me show you. I analyzed my recipe and a popular and comparable pumpkin spice recipe. So mine have more than twice the protein, five times the fiber and 1/3 of the sugar. 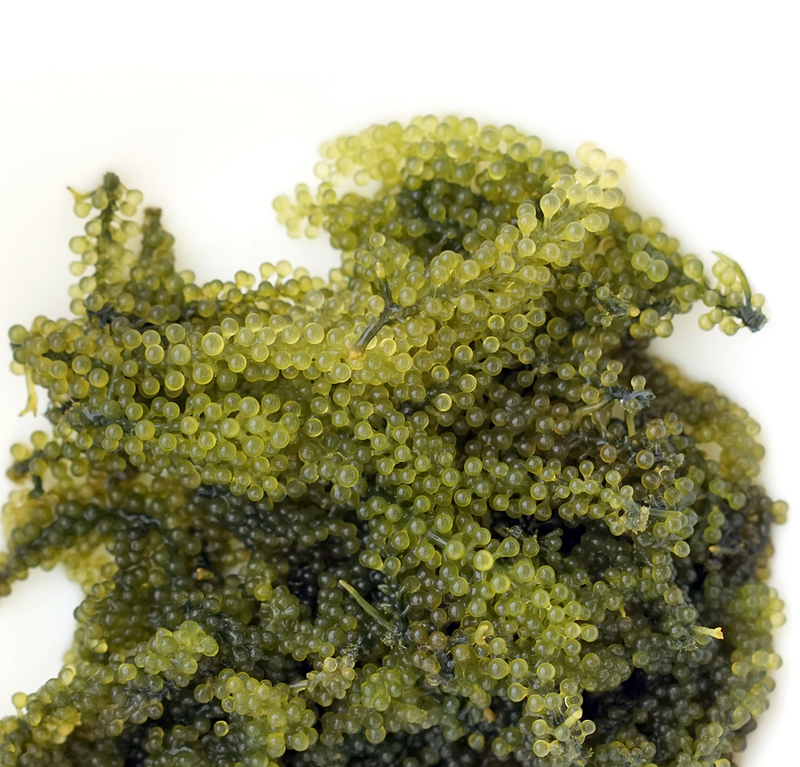 They have twice the calcium and five times the magnesium. They have 2.5 g of Omega 3 fats compared to 0.01 g for the typical muffins. And they have 14 g of net carbs versus 41 g of net carbs. There is still a lot of debate regarding the nutritional value of a gluten-free diet among nutrition professionals. But they are never comparing apples to apples (apples are, by the way, gluten free). This is a true, side-by-side comparison of a gluten free item and its regular wheat version. The only thing it does not have as much of is folate because the government began heavily fortifying refined wheat flour with folate. Why? Because no one in America can be expected to eat the natural foods that contain folate, leafy greens (foliage, get it?). Well I do eat leafy greens and if you really knew how important they were, you would too, but I digress. 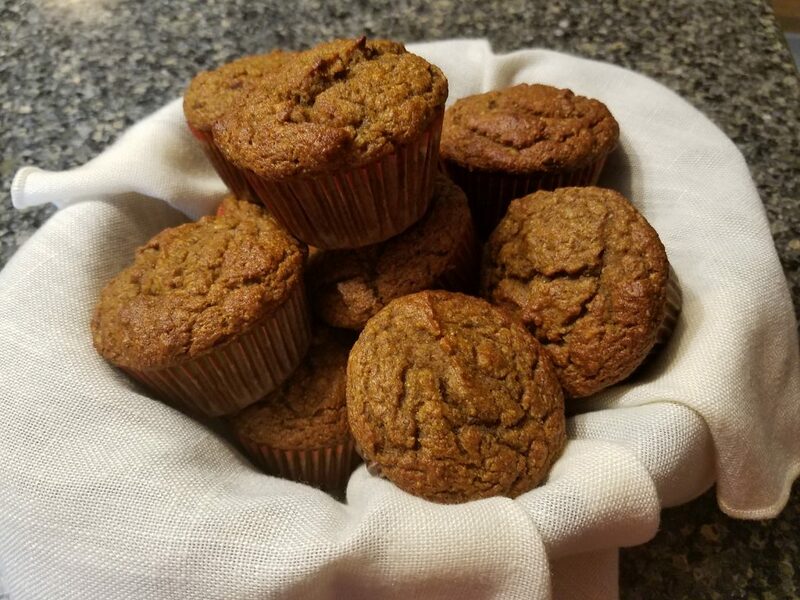 I hope you enjoy the delicious flavors and aromas of fall in these wonderful muffins. Preheat oven to 375 F. Line a 12 cup muffin tin with paper liners or grease/oil. Add liquid ingredients from food processor to dry ingredients and stir just until mixed. Fill the muffin cups until ¾ full. Bake 20 minutes or until toothpick comes out clean. Watch for more delicious recipe makeovers that are gluten, dairy, and soy free and heart, diabetes and autoimmune friendly. My fourth investigation into exactly what our Blue Zone folks eat has left this dietitian, well, intrigued. I have been exploring the data reported by National Geographic and Dan Buettner in the Blue Zones Solution: Eating and Living Like the World’s Healthiest People1. I am attempting to understand how to eat to increase my odds of living a long, robust life to 100 and perhaps beyond. 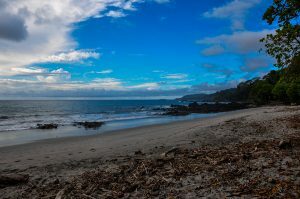 This hot equatorial Central American community, while not an island like Okinawa, Sardinia or Ikaria, is a peninsula surrounded by ocean on three sides. Again, equatorial. Again, surrounded by ocean. Yet again, they eat little if any fish. Breakfast, lunch and dinner are all varying amounts of pretty much the same things with some variations on sides. 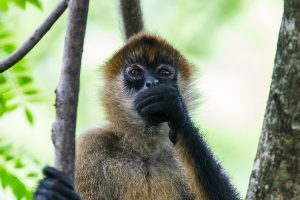 My daughter recently went on a mission trip to a rural part of Nicaragua, just north of Costa Rica and came home to inform me that that was it. Rice and black beans, homemade corn tortillas and fried plantain with a little salsa or jalapeno, avocado or fresh fruit, an occasional fried egg or small piece of chicken or pork or sprinkle of cheese, maybe some squash, sweet potato or shredded cabbage salad. The same thing every day for every meal. I have to tell you, it blows the concept of health being borne out of variety out of the water! What is it about their food, lifestyle and/or environment that gives Nicoyans such long-lasting robust health? 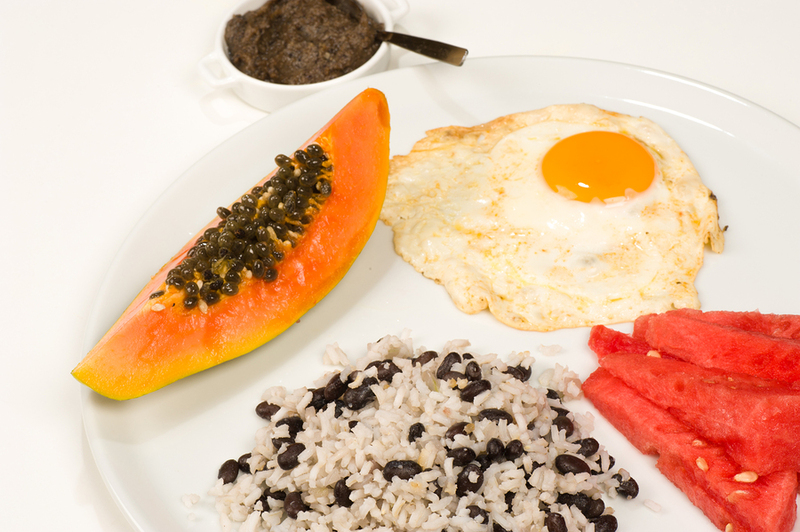 What other foods do Nicoyan centenarians eat? A lot of sugar! What? According to the book, in addition to corn tortillas, rice and beans, about 4 ounces of low-glycemic vegetables like tomato, peppers, cabbage, carrot and onion. They eat about 2 ounces a day of fried or boiled plantain, sweet potato or a local variety of winter squash, both rich in beta carotene. They eat about 4 ounces of local fruit, including papaya, lime, orange and banana. They eat a very small amount of cashews that grow regionally. But according to the book, they consume 11% by weight of added sugar. That is 33 teaspoons or about 2/3 cup every day. They start their day with very strong, very sweet coffee. And again in the afternoon, more very sweet coffee or nanju (Hibiscus esculentus seeds). So if they drink 4 cups of a hot beverage a day, there is almost 3 tablespoons of sugar, and probably some of the milk, in each one. I cannot lie. There is a part of me that does not want to shine a light on this part of their diet. But it is truth and I wish to share the whole truth. If I can figure out how this does not produce adverse health effects somewhere along the way, I will be sure to come back and let you know. No doubt, high antioxidant content of their local coffee to offset the pro-oxidant effects of the sugar is part of the story. Lime treated grains, something Okinawa and Nicoya share! I was surprised to find that a local Nicoyan dietitian described the way corn is treated to prepare it for grinding into flour is to soak it in lime (a caustic water solution of calcium hydroxide). This treatment adds an enormous amount of calcium, breaks down some proteins to more absorbable forms and makes minerals more bioavailable. In fact, the nutritionist believed this to be the most important food contribution to Nicoyan longevity. While not noted in the book regarding Okinawa tradition, I actually read on line that this is also used in Okinawa to prepare wheat for making into noodles. Huh! With all the talk about various intolerances to grain, I wonder if the answer is here in these ancient cultures and traditions that render grains both more nutritious and more tolerable. In addition to the generous amounts corn, rice and black beans, modest amounts of fruits, vegetables and meats, Nicoyans consume a rather generous amount of dairy, about ¼ of the total weight of their food, a little cheese and about a cup of milk a day. 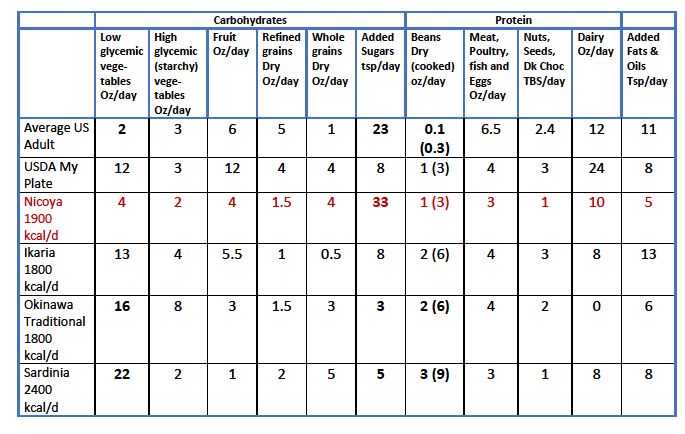 The following table compares their consumption to the US and other Blue Zones I have discussed so far. I don’t have a bias toward or against any macronutrient. I just want the truth. I am seeking meaningful and translatable information. A deep dive again reveals recipes in the book modified traditional recipes to substitute canola oil for traditional lard and soy milk for their traditional whole cow or goat milk. The recipes completely omit the cheese that their 107 year old host Panchita considered an important garnish on her gallo pinto. But the food weight % numbers did not lie and created a very clear picture of exactly what the macronutrient distribution looks like. The idea that all fat and saturated fat is damaging to health must be very hard to let go of based on the subtle misleading information in the book. Research is very clear now that these ideas that fat in general and saturated fat are bad have had serious adverse consequences in increased diabetes and cardiovascular health in the US. There are important lessons hidden in surprises. Rather than suppress unexpected information in research, wouldn’t it be better to fully reveal and explore them? A Moderate Protein Diet: Once again, this diet is moderate in protein, not low protein. In fact, again, this population is very small in stature, averaging about 5’ ½” tall for women. The proper way to characterize protein intake is per kilogram of body weight. 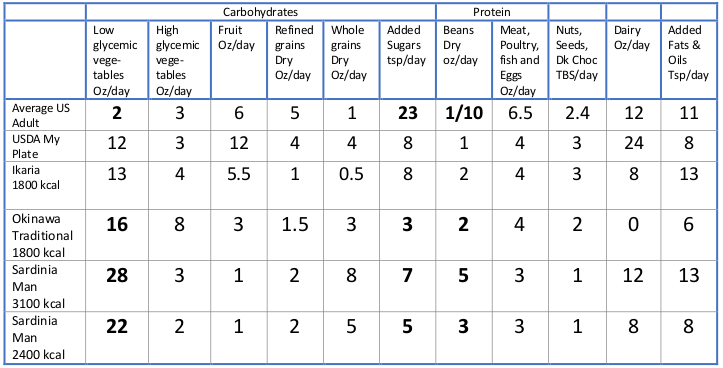 So here is how protein intake in the traditional Nicoyan diet compares to the other Blue Zones and the typical US diet. If you know me, you know that a bright colored dress and beads and a big smile certainly resonates with me personally (though my dress would be purple flowers). In truth, a plant-based diet might just fade in importance by comparison to these things. I am grateful to Dan Buettner and National Geographic for researching and publishing their findings which has allowed me to translate the information into practical dietary changes that might just enhance your quality and quantity of life! Buettner, D. (2015) The Blue Zones Solution: Eating and Living Like the World’s Healthiest People. Washington, D.C.:National Geographic Society. Buettner, D. (2016) Blue Zones: The Science of Living Longer. Washington, DC: National Geographic. Plant-Based: What does this mean? How do you know you are doing it? These questions have nagged at me a great deal over the past few years because this is the single most important piece of advice given by all variety of longevity studies from the China Study to the Blue Zones. The words are thrown out there all the time with no definition. Even I, an expert in nutrition, do not know exactly what they are saying. Now you and I know that French fries, sugar and soda are plant-based. Surely we need to be more specific than that! Does it mean “no animal products whatsoever”, as in vegan? Well that is not how Blue Zone communities eat. Not a single one is vegan. Is it amount by weight? Is it proportion of calories? Let’s see how Nicoya and other Blue Zones compare to our Standard American Diet on these two metrics. 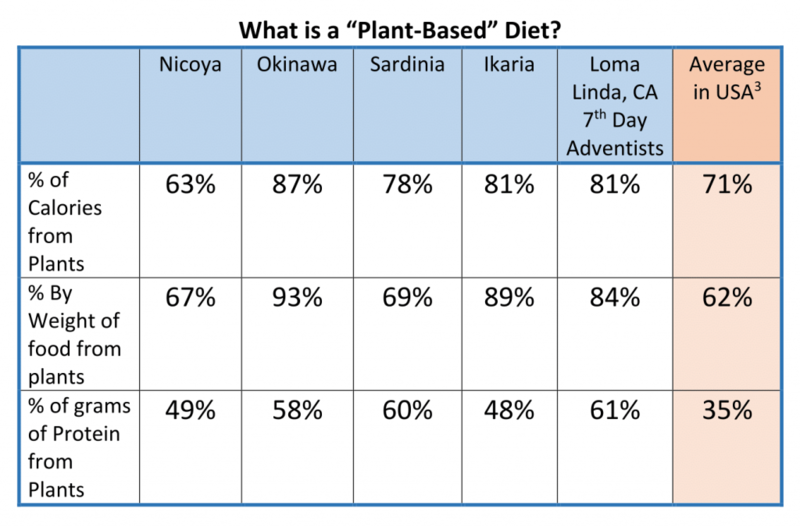 What is a “Plant-Based” Diet: Blue Zones vs USA? The average person in the US gets about 70% of their calories from plants while Blue Zones get about 80% of their calories from plants. In practical terms, it is more important which plants and in what form. Americans need to eat more unrefined, whole plant foods, especially low-glycemic vegetables and less baked goods and sugar. But in terms of the proportion of total calories, only replacing 10% of their animal food with plant food will match Blue Zone levels. The average person in the US gets about 2/3 of the weight of their food from plant products where Blue zones get 70% to 90% of their food from plants. This is starting to paint a clearer picture because the plant foods with lots of weight but few calories are low glycemic vegetables followed by fruit, high glycemic vegetables and cooked beans and grains. Sugars, sugary foods, fried foods (donuts and French fries) have a lot more calories per ounce and per milliliter of volume as well. Volume is important because it produces a sensation of fullness by stretching your stomach. This is the idea of “calorie density”, eating more food and feeling full while consuming less calories. I have previously noted that Blue Zones eat a similar amount of protein per kilogram of body weight to people in the US. To be very clear, this research has not supported the idea that people in the US to eat too much protein nor more than Blue Zones. What is important is where the protein comes from! Blue Zones get more of their protein from plants, especially beans but also nuts. People in the US get about 65% of their protein from animal sources while people living in Blue Zones traditionally get 40% to 50% of their protein from animal sources. Reduce your animal protein consumption by 1/3. US Women average about 7 ounces of animal protein per day so reduce to about 5 ounces of meat, fish, eggs and cheese a day and replace the other 2 ounces with 1/3 cup of cooked beans with each meal (yes, including breakfast! ), 1 cup of cooked beans per day! US Men consume about 10 ounces of animal protein per day and would need to reduce to 7 ounces per day. Men need about ½ cup of cooked beans with each meal or 1 ½ cups per day to replace the animal protein. 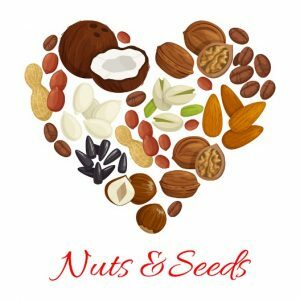 In addition, women should add 1 ounce (1/4 cup) of nuts and seeds to your daily routine and men should eat about 1.5 ounces per day or about 1/3 cup. This gentle nudge of shifting 1/3 of your protein from animal sources to plant sources will align you perfectly with the blue zones and achieve the intention of a “plant-based diet”. Beans, legumes and pulses are enormously nutritious beyond their protein content. As a nation, the US has essentially forgotten about this food group. Soy is fine if non-GMO and organic but soy is part of this larger food group that in its entirety is so very health promoting. Legumes are rich in fiber, folate and minerals. I see an entire series of blogs ahead on the joy of eating beans and recipes that include them in creative and delicious ways! Again, this group of “plant embryos” are so packed with nutrition that we as a nation largely ignore. While rich in protein and fiber, this group also contains healthy fats and oils. They are practically the sole source of vitamin E which we all are deficient in, everyone! Though you would generally think of almonds, walnuts, pumpkin seeds and flax, so too are chocolate, coffee and coconut in the nuts and seeds category. There are also two fruits which, from a nutrition profile perspective align more with nuts and seeds than fruit, olives and avocado. This category also inspires many possible future blogs with endless possibilities for delicious ways to get your nuts and seeds in every day! I sure hope this has been helpful to you because the investigation was certainly helpful to me. Having an engineering background means I need numbers! I need to know how words translate into action. I bet you do to! Sardinia, Italy: Home of the Healthiest and Longest Living Men. 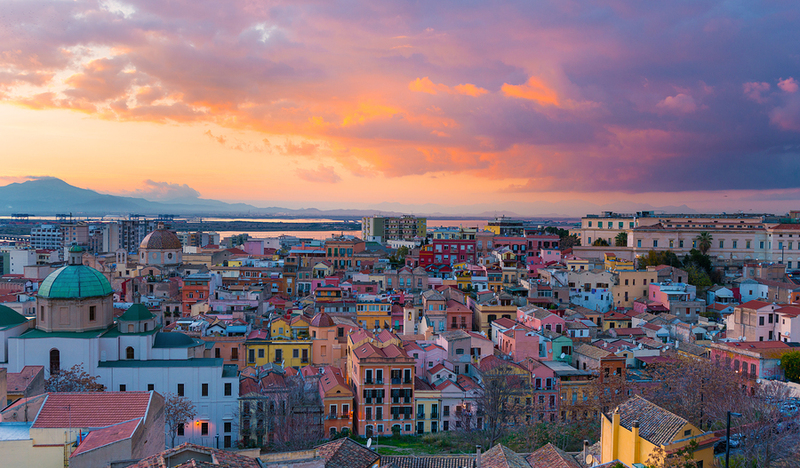 Sardinia is a large, mountainous island off the west coast of southern Italy. Here is where I decided to focus my third blog on National Geographic’s and Dan Buettner’s blue zones.1,2 I am taking a deep dive into Buettner’s research through my functional medicine, dietitian and engineer lenses. The engineer in me allows me to make sense of confusing numbers and it really came in handy with this Blue Zone data as you will see. Sardinia is where men live the longest and healthiest of anywhere on the planet. Notably, they live nearly free of cardiovascular disease. Men have an average life expectancy of 79.7 years compared to 76.9 years in the US.3,4 There are 22 people 100 or older per 100,000 people in Sardinia which ties for first place with Okinawa. However, unlike anywhere else in the world, half of the centenarians are men! Clearly, calorie restriction is not part of the story here! This is an enormous calorie consumption on a body weight and size basis (or for anyone except maybe Michael Phelps!). How many extra steps would a 195 pound man have to take to burn this extra 11 kilocalories/kilogram? 28,600 steps and about 13 miles a day, well over 3 hours of walking daily! That is almost three times the 10,000 steps per day recommended minimum for a healthy lifestyle! Unless you are a professional athlete, a landscape or construction contractor, or a professional dancer, 13 miles of walking or equal physical activity a day is just not possible. But the lifestyle of Sardinian men highlight the importance of movement and physical activity to longevity, especially for men. I have seen plenty of research of fitness and associated health benefits that show that 10,000 to 15,000 steps achieve at least 80% of the benefits. Beyond that you just get more work done, move more sheep! What can I do today? Walk 15 to 20 minutes, three times a day, 45 to 60 minutes total a day, or jog 25 to 35 minutes a day and you’ve got it done. Sardinian men drink nearly 1 1/2 cups (12 oz) of full fat goat or sheep’s milk a day. 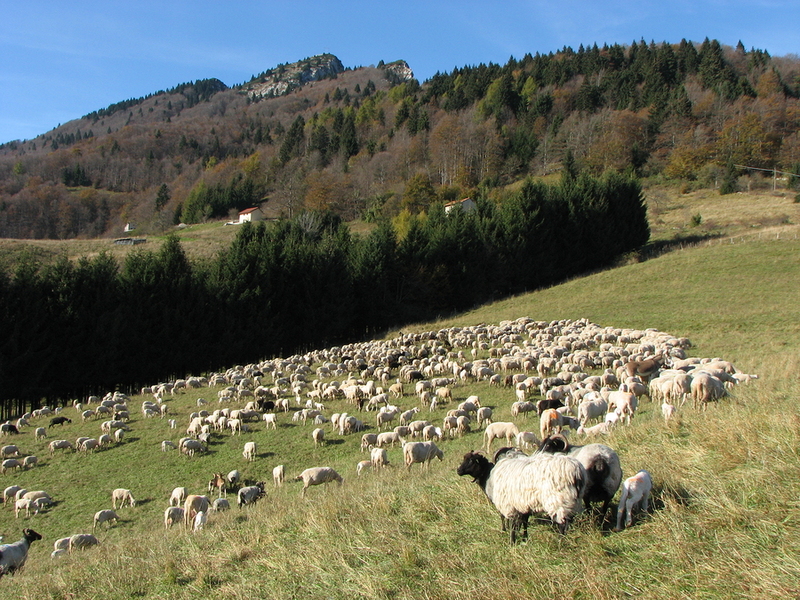 Buettner reported that 26% by weight of all food consumed by Sardinian shepherd household is sheep milk and goat cheese. Careful entry of food stuff as reported on the pie chart led to a total food weight of 1500 grams at 3100 calories. That is 390 grams of dairy. With about an ounce of flavorful pecorino Romano cheese a day, the remaining dairy is 362 grams of milk, over 12 ounces or 1.5 cups. This organic, whole, grass fed sheep milk is loaded with nutrition and healthy fats. 23g from meat, 21g from dairy, 12g from beans and 54g from other plant sources. This is a high protein diet, not a low protein diet. From Buettner’s book “Americans tend to think that more protein is good for us. But here was a long-lived population that grew up on a low protein diet.” I’m sorry but on this point I must disagree! Protein needs are properly represented on a per kilogram of body weight basis, not as a percent of calories. In this very high calorie diet, it appears artificially low. Let us look at what it really is. Sardinian men consume 15% more protein than US men on a grams per kilogram weight basis and double the DRI of 0.8 grams/kg! While 15% of calories would at least be classified as a moderate protein diet, this is a true high protein diet! What can I do today? 1.6 grams/kilogram protein is appropriate for an athlete or highly active individual, like these Sardinian men. 1.4 to 1.5 grams/kilogram is a more appropriate goal for more moderate activity levels. However, getting about half your protein from beans, nuts and seeds is key. For a US man, that is 7 ounces of meat/eggs, 1 cup whole dairy, and 3 servings of beans, 1 ounce of nuts and seeds and 6 to 8 servings of whole grain. Sardinian men drink 6-9 ounces of Cannonau red wine a day. From Buettner’s book…“Wine contributed about 110 calories, or about 2 small glasses, to the daily Sardinian diet.” Elsewhere in the same book “Sardinians drink an average of three to four small (three-ounce) glasses of wine a day.” So is it 2, or is it 3-4? On the pie chart it says “A shepherd’s average wine consumption of 114 grams (4 ounces) a day is not included in this graphic.” Elsewhere in the same book it says that the 1930 study by Fermi found that a typical resident of the hills of Sardinia consumed 7 liters of wine a month. That is 8 ounces per day. I used 6 ounces for men, who must consume more calories and more wine than the women. This is a very conservative estimate! Here is a question for you to mull over (pun intended). Is red wine more a fruit or an alcohol? From a health standpoint, I would make the case that it is at least half and half. 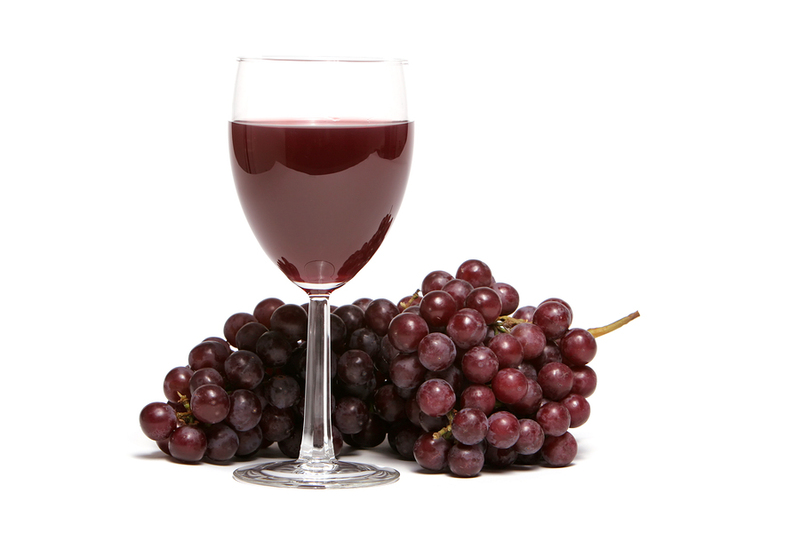 If the grape juice in wine is counted as a fruit, fruit consumption goes from 1% to 8% of weight of food! Both the locals and the visitors believe that this daily dose of potent anti-oxidants and polyphenols like resveratrol make an important contribution to the longevity of these people. Research supports the heart health benefits of a modest amount of dry red wine daily. What can I do today? Drink a 5 ounce glass of dry red wine for men and 3 ounce glass for women, or perhaps a small piece of 80%+ dark chocolate for both the health benefits and the accompanying joy. Barley is the Sardinian’s primary grain, but 24 Slices of Bread a day? “Barley was the food most highly associated with living to be 100 in Sardinian men.” “…much lower glycemic index than wheat” Figuring out exactly how much grain is consumed in the Sardinian diet was very confusing because the various numbers reported in the book conflicted by order of magnitude differences, ranging from 196 grams/day (Peretti) to 397 grams/day (Fermi) to about 662 grams/day (Buettner). No matter how I entered the food into my diet analysis software, I could not make sense of 47% of the total weight of food consumed as grains and stay under 3100 calories/day. If the weight was dry grain, 47% would be 662 gm of grain, which would produce 39 slices of bread and 2730 calories. If weight of finished bread and cooked pasta was used a heavy whole grain barley bread is much heavier than refined bread and about 28 grams per slice, so 24 slices per day and 1800 calories. If you use Peretti’s numbers, bread is only 14% of weight of food, a long way from the 47% reported in the pie chart! This would equal 8 slices of bread day, while still a high grain intake, a far more reasonable number by any standards! What if I use the description of food intake over a typical day by the Melis Family described in the National Geographic Blue Zones Book? I just couldn’t wrap my mind around consuming 24 slices of whole grain bread a day. Do these centenarians really eat that much? So I entered the description of a typical day in the Melis family into my diet analysis software with 2 servings of the family recipe for minestrone that they make daily. I made up the difference with bread. I got a total of 10 servings of bread for a man at 3100 calories per day, far more reasonable! 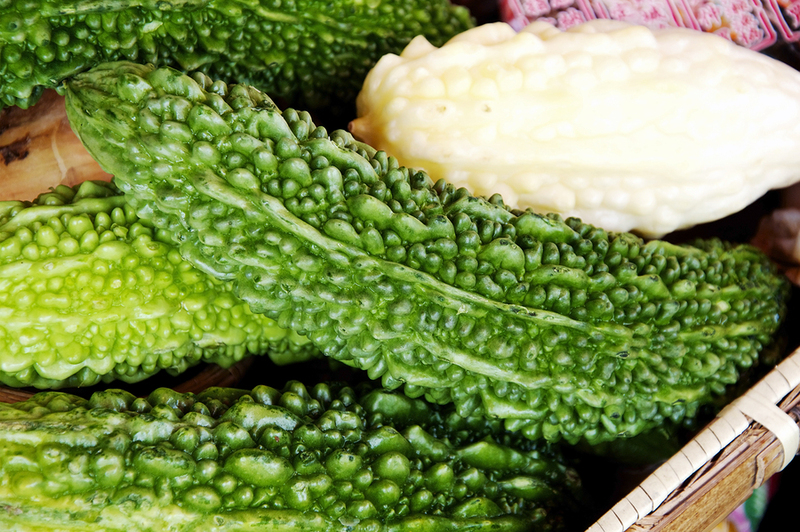 At the same time, vegetables went from 12% to 38% of food weight! Is it possible that the 1930’s researchers didn’t have good data on how much perishable vegetables these folks went to their back yard, picked and ate on a daily basis? 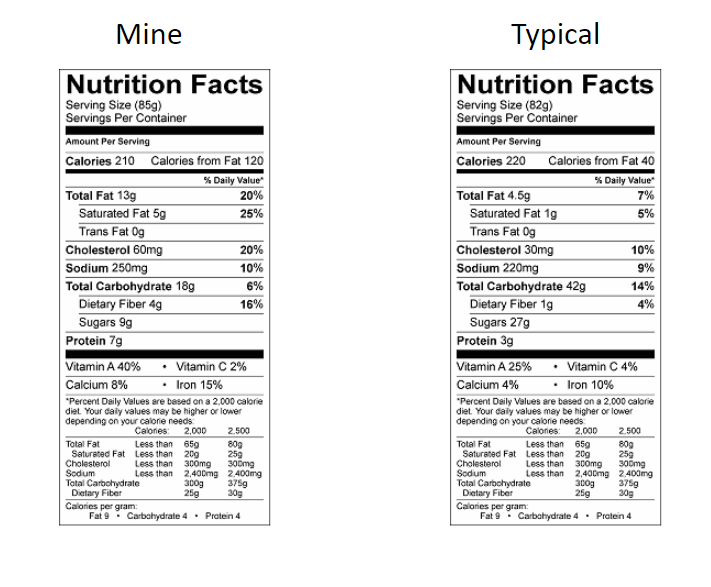 Here is how the macronutrients compared. 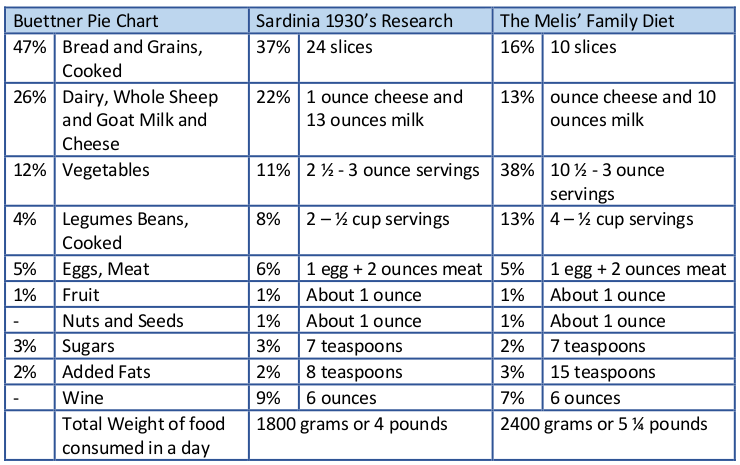 The actual intake by the Melis family, who by the way have several centenarians, consumed 32% of calories from fat, not the 20-25% reported in 1930’s data, and 50% of calories from carbohydrate, importantly shifting 7% of calories from carbohydrate to fat and more accurately reflecting a Mediterranean diet pattern. Further, this includes, as it most certainly should, wine. What can I do today? Eat lots of low glycemic vegetables. Specifically, to equal this longevity diet, men should eat 1 ½ pounds and women 1 ¼ pound every day! That’s 9 servings for men and 7 servings for women, not the 2 a day implied by the “5 a day” chide which includes fruit and starchy vegetables as well! The Sardinian (Melis’) diet have important consistencies with Ikaria and Okinawa. I added a row for how a person who only walks one hour a day might scale down calories to 2400 from 3100 in the last row. Note that calories removed came primarily from bread, sugar and added fat in relatively equal proportion and protein is maintained to appropriate levels for body size. Optimal fat in the diet is 25 to 50% of calories if unprocessed and monounsaturated rich, especially olive oil but also lard. Optimal protein is about 1.4 grams/kg body weight and at least half from plant sources, especially beans and legumes. The little things count. A little wine, a little nuts and seeds and a little lemon juice keep showing up. More than food again. Love of work and a strong family and community connection emerge once again as important factors among Sardinian centenarians. The more I read about Blue Zone people and communities, the more I believe the magic lies in a large measure in their love of life and each other. And the more I long to meet them, cook and eat with them! Okinawa: Mel Gibson might know what women want but this place has what women need, to thrive even into their second century, that is. Welcome to my second deep dive into the lifestyle of people who not only live beyond 100 years, but do so with a high functioning body and mind. Come with me as I use my nutrition and functional medicine lenses to translate lessons from these research findings into actionable diet changes. Dan Buettner, National Geographic, Bradley Willcox MD, Craig Willcox PhD and Makoto Suzuki MD1,2,3,4 have studied older people on this subtropical island because here is where women live beyond 100 at a greater rate than anywhere else on the planet. They live longer, on the average, than women of the rest of Japan and neighboring China. They live longer than their male counterparts (though men live long also) and far longer, on the average than women in the US. Do Okinawan people have better genes? Clearly not. 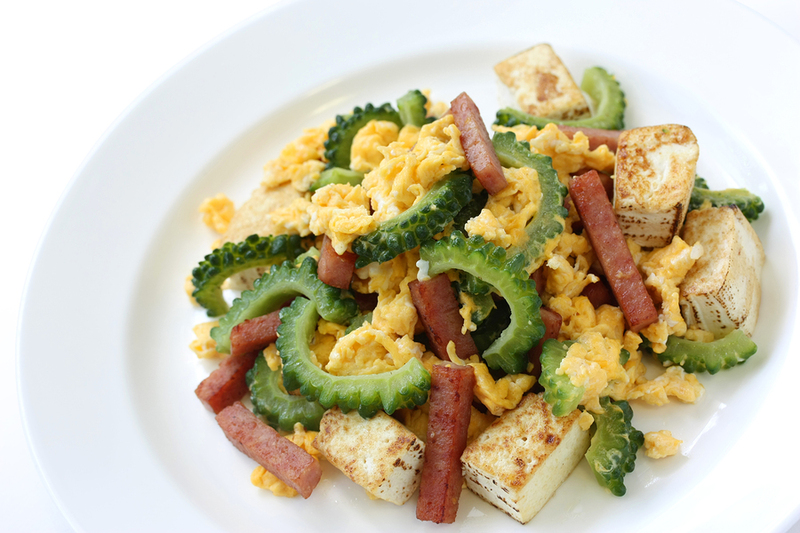 Modern western foods are rapidly gaining popularity in Okinawa among younger people. Along with these eating patterns are developing obesity, diabetes, cardiovascular disease and cancers among the younger population. In fact, these diseases are exceeding typical levels overall in Japan. In addition, Okinawans who move to Western countries have chronic disease rates and life expectancies typical of the country they move to. Only elders who are eating and living in traditional ways are reaping the health benefits. What do traditional Elder Okinawan women eat? This turned out to be a much more difficult question to answer than I thought. Not only is the traditional Okinawan diet profoundly different from a typical western diet, it is very different from the rest of Japan and China, though influences from both are clear. The biggest challenge is that even the traditional food composition has been in dramatic flux since the time that current centenarians were born. The studies report foods consumed as a percent of total weight of food consumed. Sweet potatoes went from over 90% to about 5% in modern times. They were replaced by grains, mostly rice, that went from 15% to 32% according to the Willcox books. It was unclear how much the elders retained sweet potato as a staple and how much of their diet is actually grains. I had to analyze a few traditional dishes to get a clearer picture. Like Ikaria, alcohol and nuts and seeds are not counted. Alcohol is part of the traditional cuisine, especially for cooking (and what cook among us doesn’t sip a little as we cook?) Sesame and peanuts are very common ingredients in traditional foods of Okinawa. The amount is small, but important. The amount and type of fat is a serious point of contention as I’ll explain. Historical Perspective5, Adaptation and the Importance of the Satsuma Purple Sweet Potato. 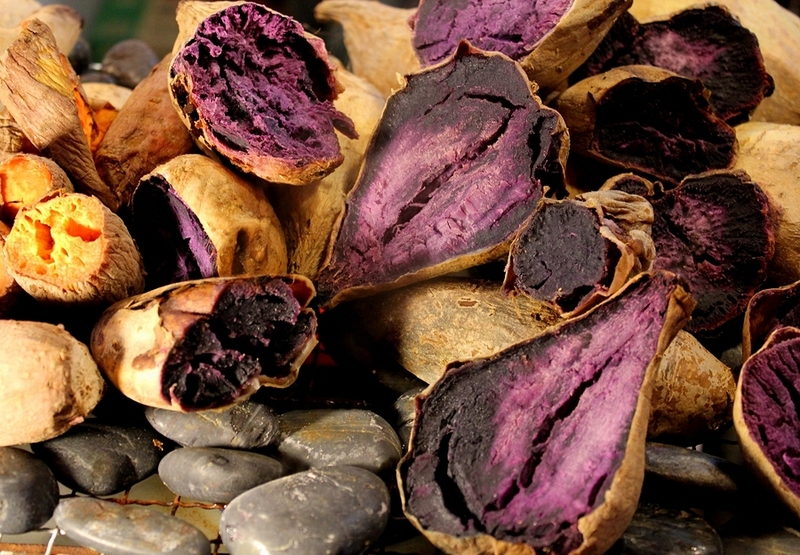 The purple sweet potato was introduced to the island around 1600 from Mexico by way of China. Okinawa is not a friendly environment for agriculture, especially rice, the usual staple in this part of the world. Cycling between periods of extreme famine, poverty and typhoons, one thing grew really well in the mineral rich, hot, dry soils and subtropical climate, the Satsuma purple sweet potato. First record of food intake puts the purple sweet potato at 93% by weight of all food consumed in Okinawa in 1879. In 1949 post-war, the entire population of Okinawa was under stress of starvation again and the purple sweet potato was 67% by weight of food consumed. Rice was favored as a staple food in both China and Japan throughout their history. When times got tough, these nutrient rich purple vegetables always came to the rescue of the people of Okinawa. I read many times over how the elders view the purple sweet potato as the reason they survived. But it is a love-hate relationship. Given the option of rice, even they would still choose rice over sweet potatoes, if they didn’t know the powerful health advantages. They have a similar view regarding sweet potato as many elders in the US have regarding beans. Our elders had to eat beans during the depression and war times when meat was scarce. This has shaped attitudes in the US toward this entire class of “super foods”. It was a similar love-hate relationship, but we did not notice or treasure the health benefits of being a bean-eater the way Okinawans noticed the benefits of eating their precious purple sweet potatoes. I want you to note that a Western World native food not only saved the Okinawa people but in part lifted them to among the healthiest on the planet. Pork is the Companion Health-food to Sweet Potato in Okinawa5,6,7. Here is where my research departs from that reported by the Willox’s and seriously downplayed by Buentner. Raising pork became possible on the island when sweet potatoes arrived and pork has been an important part of the traditional cuisine ever since. Pork is revered by locals as a health food like the sweet potato. This idea must have been just too outrageous for our esteemed researchers to accept. Yes, they consume very modest quantities and mostly during festivals. However, they have a total of 32 festivals a year, more than one every two weeks! Distributed evenly over 365 days, the traditional average daily intake of pork is 21g, or ¾ of an ounce6. Americans eat about 3 times that much pork on the average, along with even more beef, too much, no doubt. It seems as though researchers should have included holidays in the Okinawan diet journals like dietitians include weekend days! It is reasonable to see pork as a “health food” in moderation when you consider pork is a very high quality protein rich in thiamine, other B vitamins and monounsaturated fats. It is Okinawa tradition to use every part of the pig, including the blood, ears, organs and feet. Nothing goes to waste. The meat is generally stewed with a form of acid (vinegar or citrus) or alcohol (Awamori: a millet brandy) that reduces oxidation of fats and formation of advanced glycation end products. The meat and bones are cooked slowly for a long time, producing a version of bone broth that is rich in collagen protein and minerals. Such a practice is part of traditional food cultures around the world and is touted for its health benefits. The solid fat is skimmed off in a process called Akunuki. Is it thrown away? This is suggested, but I doubt it. Huri Hachi Bu “Stop eating when 80% full.” A human experiment in calorie restriction? Many animal studies have found conclusively that life-span can be extended by calorie restriction. These studies all state that no human experiment can be done due to ethics and sustainability limitations. The researchers describe the Okinawan elders they observe whispering the words Huri Hachi Bu before every meal as if saying a prayer of gratitude. The practice of ending their meal when they feel 80% full is not borne out in their actual calorie consumption when you consider Okinawans are significantly smaller in stature than the rest of Japan. Japanese and Okinawans both are significantly smaller than people of the US and have significantly smaller frames as well. Look at the following table. The traditional Okinawan diet contains ¾ of the recommended servings of grains. This is a generous estimate, based on more recent numbers that are far higher than historic levels with higher sweet potato intake. Vegetables are about twice that recommended while fruit is only 1/3. There is no dairy, though osteoporosis and hip fractures do not plague this population. Protein is higher than recommended because of the high bean content of the traditional Okinawan diet, though grams of protein is not as high as this would suggest. Here is a deeper dive into what and how much Okinawan Elders are eating. This chart shows that, while touted as a low fat and low protein diet, it must be characterized as moderate on both accounts. Similar to Ikaria and the USDA recommendations, it is high in fiber. The following chart shows more detail about how much food is consumed. 90% of the benefit by putting a rounded cup (about 6 ounces) of steamed or stir-fried veges on your plate for every meal. In addition, they eat about 6 ounces or two servings of their purple sweet potato and often pumpkin, both high glycemic vegetables, for a total of 7 to 8 servings of vegetables every day. The traditional Okinawan diet includes 1/8 the added sugars and ½ the added fats of typical US adults. What can I do today? A family of 4 for a week would need to buy about 5 pounds of leafy greens (Kale, spinach, Swiss Chard, Romaine or leaf lettuces, etc) and 20-23 pounds of other vegetables, maybe 8 pounds fresh and 12 pounds frozen. Water. Yup, water. Calorie density is a big part of the traditional Okinawan food story. In the traditional Okinawan diet, soups, broths and non-starchy vegetables are the mainstay, breakfast, lunch and dinner. 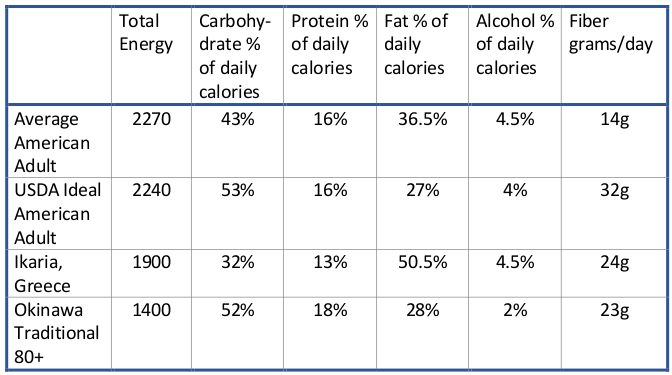 Calorie density is represented by the calories consumed per day divided by the grams of food consumed. In the traditional Okinawan diet calorie density is about 1:1 so they consume about 1800 grams of food with 1800 calories, about 4 pounds of food per day. A typical American calorie density is about 1.5:1 so we typically eat about 3.5 pounds of food, feeling genuinely less full because we are, by the way, but consuming about 2400 calories! This is the basis of Barbara Rolls and Robert Barnett’s insightful weight loss book “The Volumetrics Weight-Control Plan”11. What can I do today? 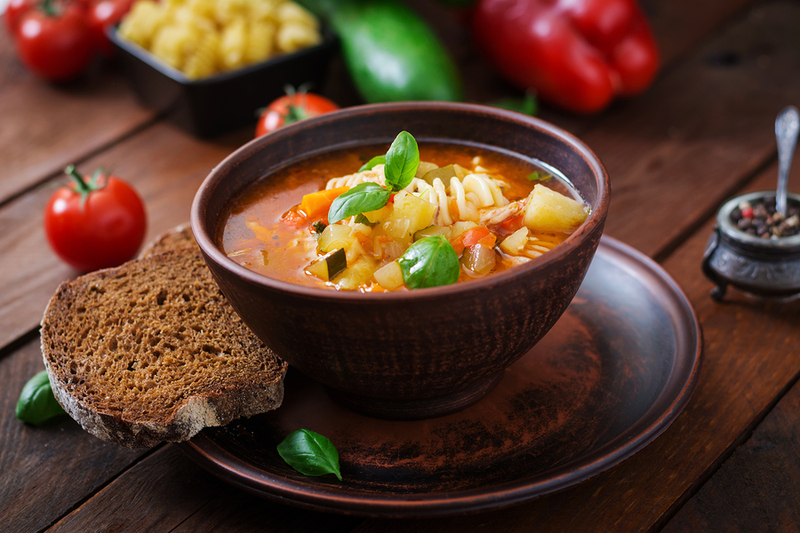 Make a pot of homemade vegetable soup. What I can do today? Drink water and stop buying juice and sweet beverages. Try brewing jasmine or chai green tea. If you miss the sweet, remind yourself that research is clear that drinking calories is a deadly habit for your body and your brain. Keep your money in your pockets and stop lining the pockets of the greedy beverage companies who have you addicted to this sweetness. Tofu and soy is consumed every day in the traditional Okinawan diet. It is traditionally consumed at all three meals and Okinawa has their own extra firm full fat ver sions that they purchase fresh, still warm, at the market. It was a little difficult to extract exactly how much because 6%, 16% and 12% of food was all presented in the research and books. My best estimate of traditional diet level is 40 g or about 2 ounces a day of tofu. Soy is often discussed as a superfood separate from beans, especially because of its isoflavone composition, a compound that stimulates estrogen receptors.14 This might actually be really important since a female Okinawan centenarian women lives half her life after menopause! Still, soy is a bean. Other beans, like adzuki beans and bean sprouts, make a significant appearance in Okinawan dishes as well. Much of the health advantages that soy brings to the table (pun intended!) are shared with other members of this underappreciated food group. 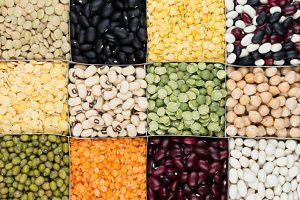 A rich source of plant protein, folate, minerals and very high fiber, beans once again make a significant presence on the longevity food scene. 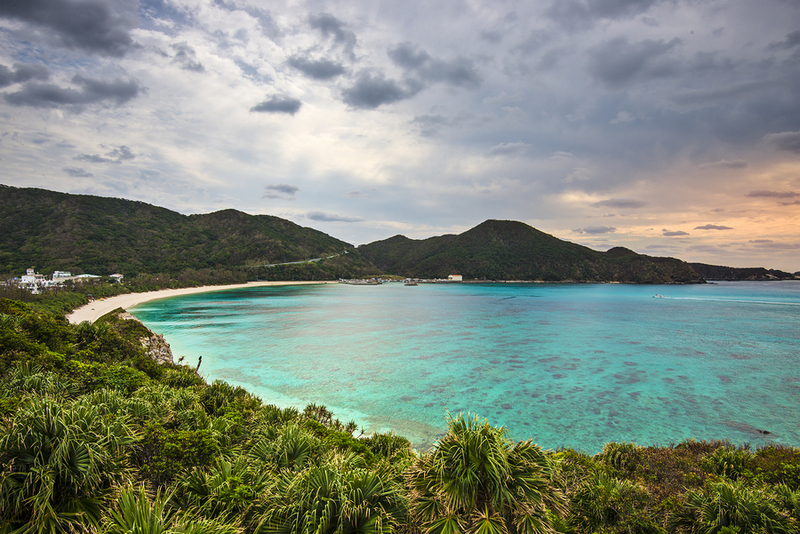 There is much to Okinawan Longevity beyond Food! Hormesis The word hormesis means exposure of a biological system to moderate stressors makes the system more robust and healthier. This idea is emerging in forward-thinking medical circles. The old adage “That which does not kill you makes you stronger.” is bearing out in research and systems biology! No doubt, the harsh environment and historical challenges the people of Okinawa have endured have made them a special breed of survivor! Food Doctors are not alternative nor complementary in Okinawa, they are primary care providers. In Okinawa, the first called and most revered physicians are the ones trained in food as medicine5,7. These are their primary care physicians and their medicine is literally special food and herb soups and broths, teas and decoctions for all common ailments and illnesses of ordinary life. They use real food, not pills or extracts, herbal or otherwise. These physicians receive rigorous and specialized science-based training just as emergency-focused physicians of their culture do. Here in the United States, the expression “Food is Medicine” is used by only a few of us heretics and the general world view of healing is that only drugs and scalpels contain powerful medicine and food is weak and impotent against our modern health maladies. Everyone in Okinawa treasures food for its medicinal power and makes food choices in their daily life with this belief system on their mind. Moai, Friendships for life, and Yuimaru, The Power of Community. An Okinawan moai is a lifelong close circle of friends that support each other through life’s ups and downs. They are assigned in a formal way in youth and Okinawans take their responsibility to their moai very seriously. Here in the US, my mother-in-law has been part of a prayer circle in Madison, Wisconsin for 50+ years and she talks about the “girls” in this group as if they were sisters so I understand a little about how powerful this can be. Yuimaru is described as “a practice of sharing and helping others”2. As it is described in The Okinawa Program book, it reminds me of what my grandmother described to me as a “barn raising”. When something needed done, the community gathered together to get it done, be it building a barn or harvesting crops. Everyone watches out for each other, even strangers. It is a sense of responsibility beyond charity. It lifts up something that you feel an integral part of. What I can do today? Make a lunch date with a friend you haven’t seen in a while and hand your leftovers from the restaurant to the homeless person outside. Watch for more conversations from me in the future on the importance of sense of community to transforming health. Next week I will discuss the place where men live longest, Sardinia, Italy and identify possible differences in optimal diet between men and women. We have assumed that the optimal diet would be the same for both sexes. This is a very new line of inquiry and there is early evidence that optimal diets are not the same! Aramun jooguu ya duu ganjuu. One who eats plain food is healthy. Willcox, B. J., Willcox, D. C., Suzuki, M. (2004) The Okinawa Diet Plan: Get Leaner, Live Longer, and Never Feel Hungry. New York, NY: Three Rivers Press. Economic Structure of Local, Regional and National Hog Markets in the Self-Sufficient Region-Okinawa’s Case (Department of Agriculture). Found at http://ci.nii.ac.jp/naid/110000220190/en. Nishihira J, Tokashiki T, Higashiuesato Y, Willcox DC, Mattek N, Shinto L, Ohya Y, and Dodge H. Associations between serum omega-3 fatty acid levels and cognitive functions among community-dwelling octogenarians in Okinawa, Japan: The KOCOA study. J Alzheimers Dis. 2016 February 16; 51(3): 857–866. doi:10.3233/JAD-150910. Rolls B, Barnett RA..(2000) The Volumetrics Weight-Control Plan. New York, NY: Harpertorch. Hooper L1, Ryder JJ, Kurzer MS, Lampe JW, Messina MJ, Phipps WR, Cassidy A. Effects of soy protein and isoflavones on circulating hormone concentrations in pre- and post-menopausal women: a systematic review and meta-analysis. Hum Reprod Update. 2009 Jul-Aug;15(4):423-40.